One actual tradition my family since the time the movie came out on vhs(yes I said vhs) has had, I’ve passed down to my kids, and we watch every year during Christmas. No certain day, but more than likely during their school break. 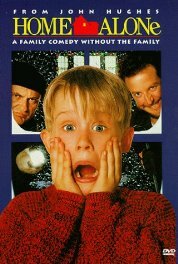 Home Alone was released in 1990, a little over a week before my birthday. My brother and I loved the movie so much, my mom rented and bought the movie for us to own. My brother loved it a little too much, as he recreated every booby trap on the screen. My mom hated that. Even after we grew older, every year, we watched this movie, and by the time we were adults, we knew the movie word for word. I then passed on this tradition to my kids. I get snacks, and we camp out to watch the movie, without interruptions. We watch as if we never seen the movie before. I guess it’s an awesome movie for me, now as a parent, to see a child that resourceful. I mean I would hope my kids would call for help after seeing I left them, but if not, I hope they are as resourceful as Kevin was. Now, before you go ‘This mom condones leaving kids home alone?’ No, not by any means. That if I was in that exact situation, I would hope they would be that resourceful and not spaz out. Gives me hope I raised them with good sense. In any event, Home Alone is a great movie to show because of the under lining message of being careful of what you wish for and appreciating what you have. It’s a great holiday movie for the family to watch and in our house, a classic. Go out and find it! Turn off the electronics and outside distractions, and have a great laugh like a kid again…….Ya Filthy animal!